“OneConnect” is trademark feature of F5 LTM (Local Traffic Manager) which leverages HTTP 1.1 keepalive. 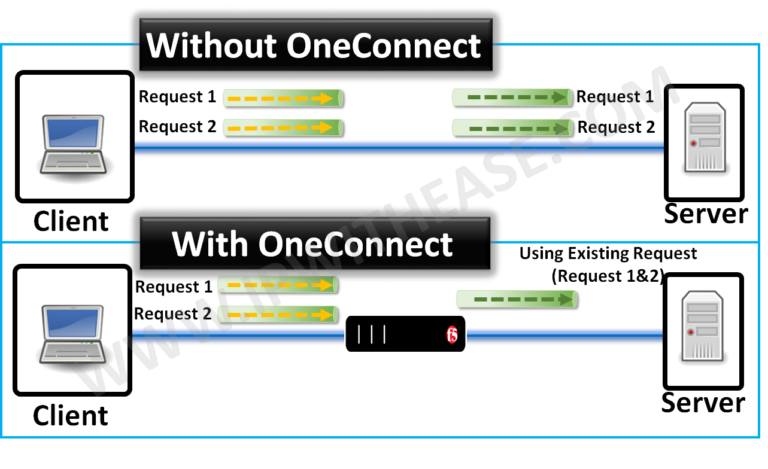 OneConnect Feature enhances Web Application performance and reduces load on Server by reducing the number of concurrent TCP connections made with the clients. F5 BI-IP LTM uses the connect of Connection Reuse Pool – After LTM has sent request and received full response through the connection , these connections are not torn down , rather put in the Connection reuse Pool. When a new Client creates TCP connection with LTM (LTM sits between Client machine and actual Server), LTM reuses existing TCP connection from Connection Reuse Pool instead of creating new LTM-Server TCP connection. This approach saves the system resources like memory, CPU processes etc. of LTM and Server. OneConnect’s most significant benefit is efficient utilization of system and resources with no need of additional resources. Let’s take an example to illustrate OneConnect Scenario in better way – Client (IP = 10.10.10.10) initiates a connection to the VIP 20.20.20.20 which gets further load balanced to the server 30.30.30.30. In TCP connection, the client machine will utilize multiple Request types to obtain the right content from the server (using HTTP 1.1 Keepalive). After the communication between Client and Server via LTM has completed, the client closes the client side connection (i.e. Client to LTM) However, F5 preserves the F5-to-Server side connection. If a new client (Let’s say IP = 10.10.10.11) initiates a connection with the server, the F5 reuses the server side connection that was used in TCP connection with 10.10.10.10. When a connection is made from user to Server machine , Server Operating System allocates memory for the TCP connection and connection buffers .It becomes intensive to setup new connections compared to receiving requests on an already open connection. This led to invention of HTTP keep-alive and became indispensable part of HTTP/1.1. For each connection, memory is consumed by web server and as concurrency goes to hundreds or even thousands, the effective CPU and memory required for real data processing and responding dramatically reduces. Not only will “OneConnect” feature reduce load on Servers , it helps improved end user experience and reduced OPEX and CAPEX hence cost savings.